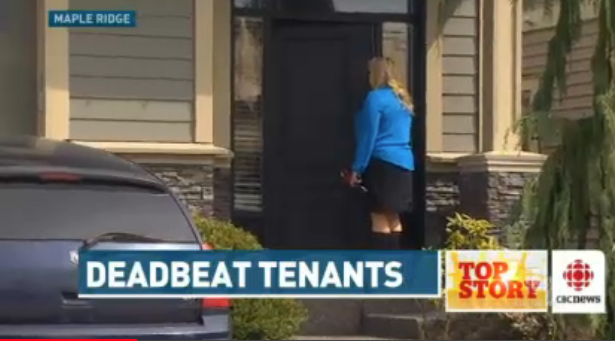 6th Time’s a Charm For Deadbeat Tenants! Susan and Chris Perret have been served with an eviction notice again — the sixth time in two years and only one day after the CBC first broke the story on these two. Cara Falconer said she rented to the Perrets in Maple Ridge without a reference because she believed them when they told her their previous landlord had stolen their money and left town. Falconer is already out $1,500 after the cheque for April bounced. The couple gave Falconer a $750 cash damage deposit and $400 cash for a pet damage deposit, as well as three cheques for three months’ rent for the top storey of a house at the north end of 236th Street. But the Falconers are not counting on the rent cheques clearing for the next two months. That’s probably a safe assumption. What company would you recommend for doing credit checks and tenant screening. I have researched two so far, but pricing is quite a range apart from each other. My rental properties are located in Sudbury, Ontario.